what medium is used in sea waves at play? That was done in acrylic paints. It is one of the Baby Crickets series of ocean art cards that I was painting for awhile and it is only two and half inches by three and a half inches. 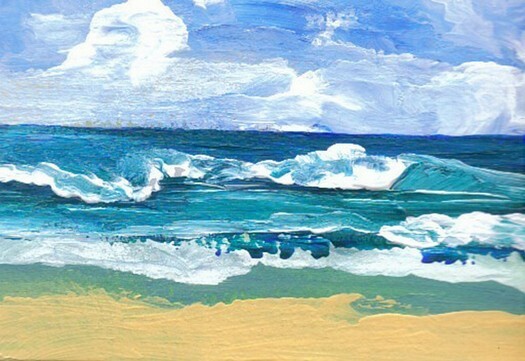 Tiny, really – but, I love the way it described my memories of the ocean on the day I painted it. I love the wave play it captured. I was so surprised when you just said how small this piece is! It has wonderful detail and to me it is joyful and peaceful at the same time. It is inspiring me to paint again! Thankyou for your wonderful comment. Now, I’m inspired to paint some more, too. How sweet. The day is perfect for that since the snow and ice still covers everything. I can think about the ocean and not be cold . . .
Ah, that’ll work. I always liked the excitement of seeing how they come out – whether it is a small art card size or the larger paintings. There is an immediacy to the small ones, though, which can’t be matched. I get to see it now, which is nice. I look forward to seeing what both paint next – or create . . .
Hello, I’m a student who’s currently looking for a perfect background for my juice project advertisement here in philippines. And was just wondering if I can use this picture for a background coz well, it is quite wonderful and would help a lot. It is for school purpose only, Can I? please? If no, then..oh well, at least I can still look and admire it’s wonderful detail. Provided it is for a school project – and if you are sure to give credit to me as the creator of it somewhere in small script below the image or somewhere in the small script of the text – doesn’t have to be large, just art image by cricketdiane. Thanks so much and I’m very glad you like it. Please do a wonderful project and good luck with all your school work. thank you so much! I surely will mam! Thankyou for the suggestion – I’ve been thinking about that too. It would look a lot better and be more readable that way. Thanks for taking the time to remind to get on about doing it. of clever work and reporting! Keep up the excellent works guys I’ve incorporated you guys to blogroll. of plagorism or copyright infringement? My site has a lot of exclusive content I’ve either authored myself or outsourced but it looks like a lot of it is popping it up all over the internet without my authorization. Do you know any methods to help stop content from being stolen? I’d certainly appreciate it. and my domain looks like, “http://mydomain.com”. Don’t know. The earlier blogs have it and the later ones don’t. Not sure if it is possible to add the name as you have chosen to display it as the http unless you get the annual blog package for about $99 from wordpress that allows full use of features to alter the CSS and other elements completely. Try consulting the wordpress.org information or in the tech help pages. We are Europe’s leading designer, manufacturer and supplier of wind turbines and monitoring masts BRITGROUP is leading the way in wind power and monitoring services and technology. With an international reputation for quality engineering and product performance we provide one of the most comprehensive ranges of wind power monitoring equipment available anywhere in the world. Not only our monitoring masts to the highest EU standards and capable of withstanding the harshest climates, but our continual innovation means that you have access to a fully integrated wind monitoring capability. You can choose from a complete range of integrated products incorporating the latest in monitoring equipment, data logging and sensor options – from the simple to the sophisticated, depending on your needs. With our commitment to making high performance wind monitoring as easy and cost-effective as possible, BRITGROUP is simply the best way to see the wind BRITGROUP also make our own wind turbines and street lamps we sell worldwide and have our own Network of installation people . C Phillips | Cricketdiane’s Weblog is kinda vanilla. how they create news headlines to get people to open the links. task and our whole neighborhood will likely be grateful to you. that means ‘glue’. Chrysocolla is an amorphous type of crystal and usually contains some amount of aluminum and quartz. Hey there terrific blog! Does running a blog such as this take a lot of work? I have very little expertise in coding but I was hoping to start my own blog in the near future. share. I know this is off subject nevertheless I simply wanted to ask. I am not sure where you aree gefting your info, but great topic. I needs to spend ssome time learning more or understanding more. I do not know whether it’s just me or if everyone else experienhcing problems with your site. else may I am getting that kind of information written in such an ideal manner?